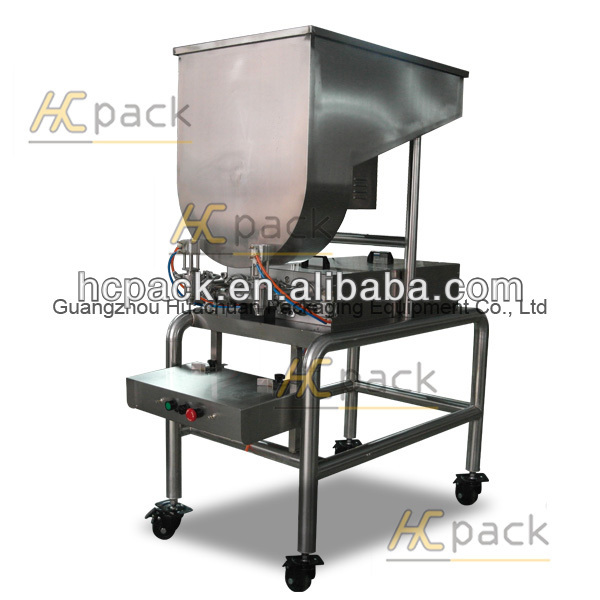 The machine is widely used to automatically fill semi-liquid, ointment, paste, dense catsup and all kinds of materials with granule in it, such as fruit flesh beverage, honey, syrup, jam, peanut butter, sesame paste, tomato sauce, chilli sauce, etc. The filling machine employs plunger type to measure the filling quantity and linear type to feed bottles, integrated with the electric and pneumatic components which are world- renowned brands of low failure rate, stable performance and long service life. 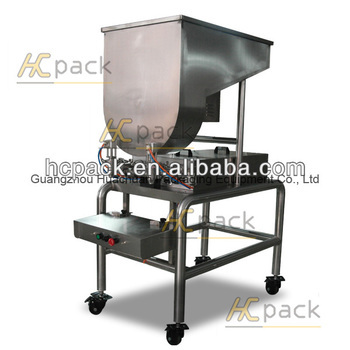 This filling machine is possessed with both manual and continuously automatic operations which can be switched quickly. The charging basket shares the functions of automatic control of feeding material and stirring; the filling head is equipped with a leakage-proof device to make sure no drip when filling. The plunger and sealing element are made from PTEF which is corrosion-resistant, damage-resistant and high temperature resistant. It can be used for filling materials under 95 degrees.